Despite my noble bid for longevity, I have been suffering a great deal this week with a sore throat and bad cough. At first I attributed this to the excessive use of air conditioners here – they really are necessary in this heat, but don’t seem to do much good otherwise. Then my boyfriend alerted me to the fact that air pollution in Hong Kong has been at its worst ever levels in the past few days, with the elderly and sick advised to stay indoors – fairly alarming news. My students, of course, have another theory, which is that I scold them too much and it has cost me my voice. Fortunately, my disapproving glares speak a thousand words, so I can still keep them in line regardless. 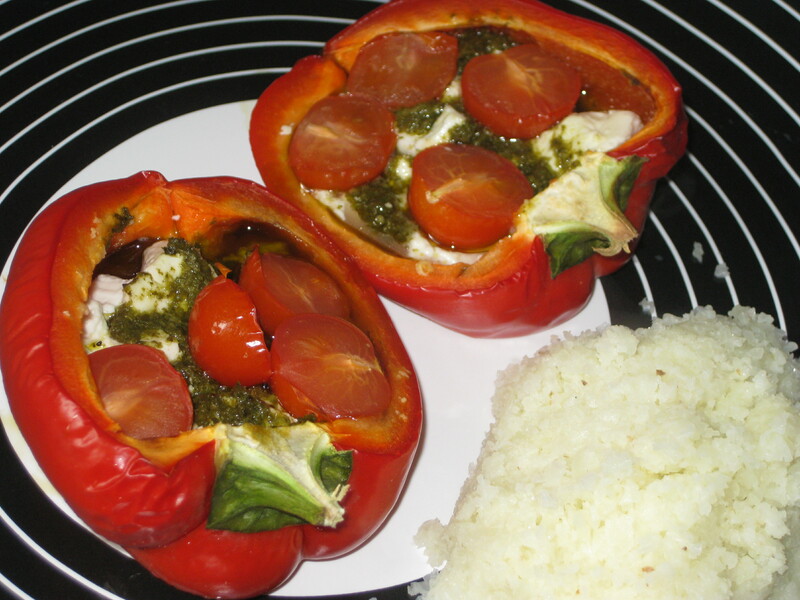 Whatever the cause, I’m keen to get back to full-scolding-strength, and here is another dish that I like to think is health-boosting (peppers, tomatoes, cauliflower), even if it does contain some naughtiness (pesto, cheese). The cauliflower mash isn’t the best alternative to mashed potato I’ve ever tried, and I can think of better partners for the peppers, but they are the real highlight anyway: juicy, flavoursome and incredibly tasty. 1. Preheat the oven to 200C. 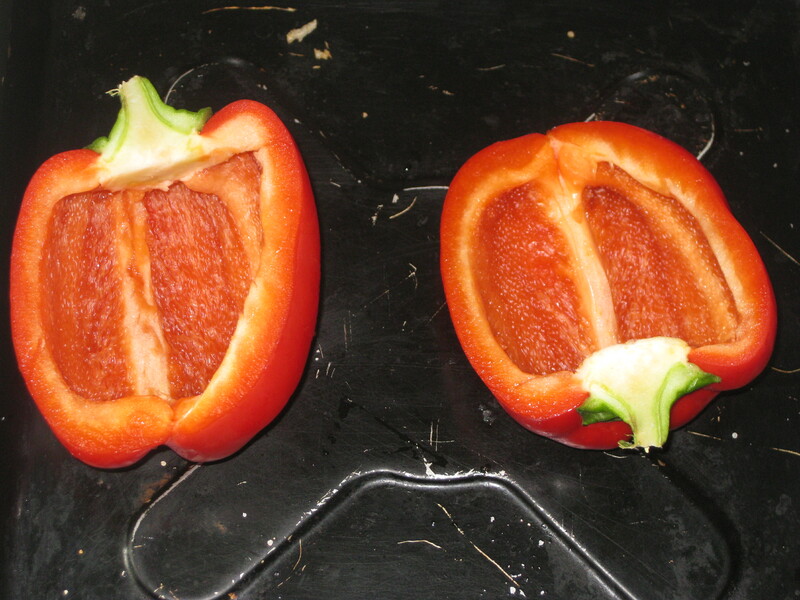 Halve the peppers, cutting right through the stems too if you can. Trim the insides, discard the seeds. Put in a roasting tin. 2. 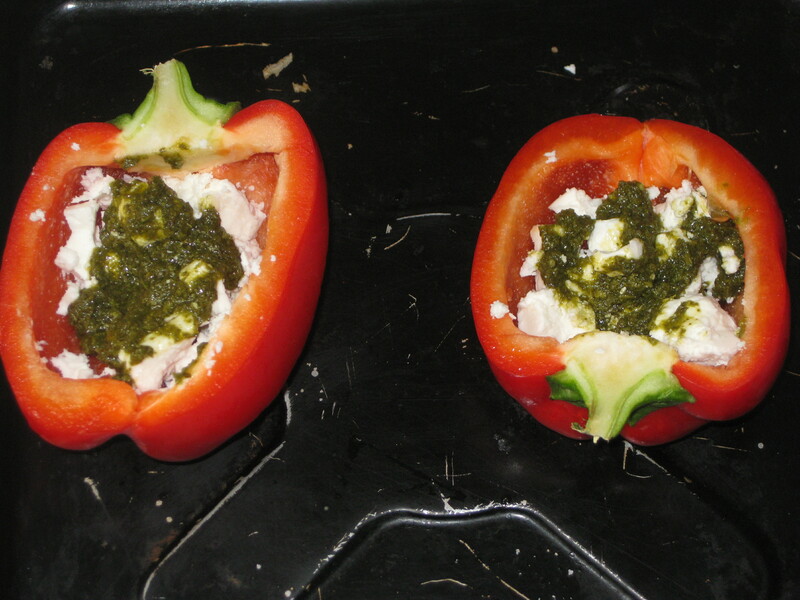 Divide the feta between the peppers, then spoon over the pesto. 3. Top with the tomatoes. 4. Bake for 30mins, until the insides are full of juice. 5. Meanwhile, make the mash. 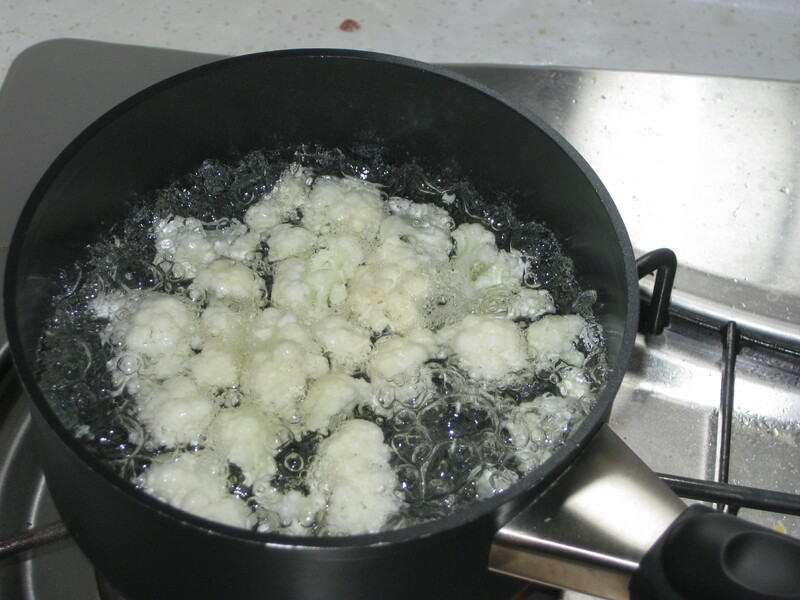 Bring 5cm depth of water to the boil in a pan, add the cauliflower, bring back to the boil, cover and cook for 5-6mins until tender. 6. 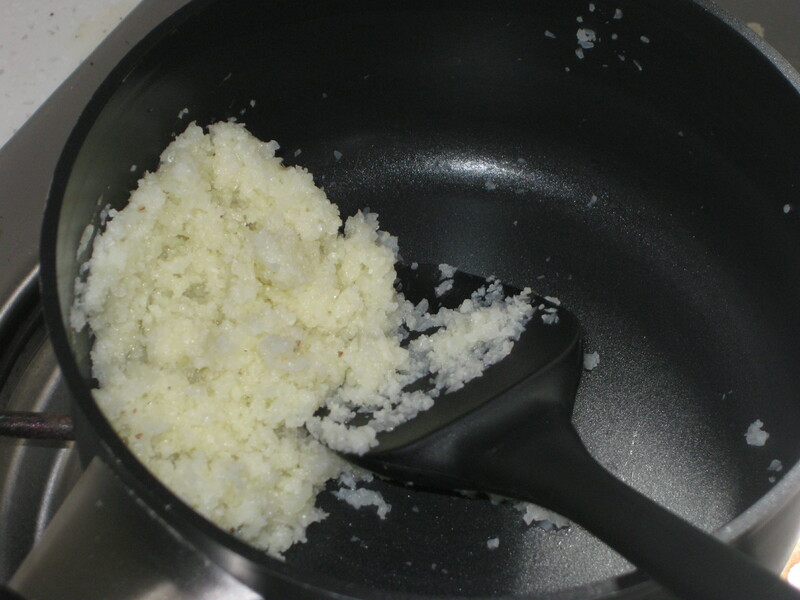 Drain well, put in a food processor with the butter and seasoning, then whiz to a smooth, thick mixture. Return to the saucepan and gently reheat. 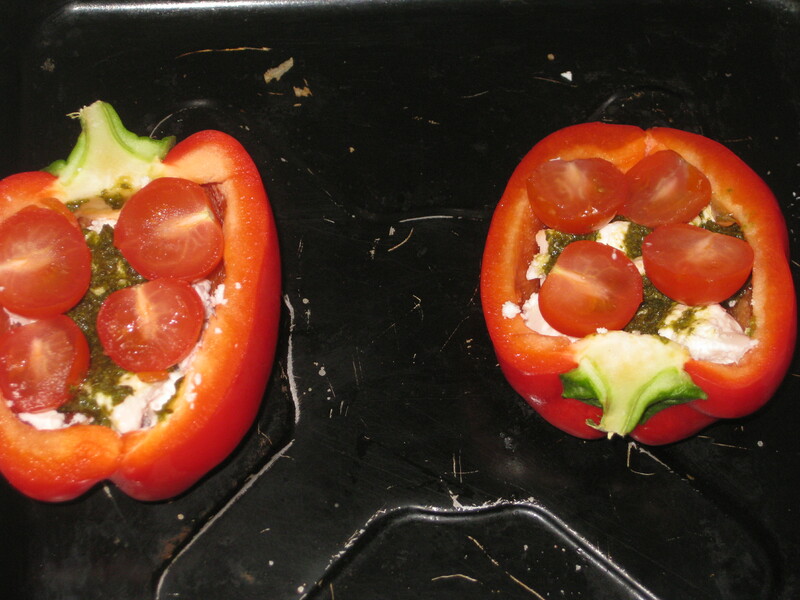 Serve with the peppers. 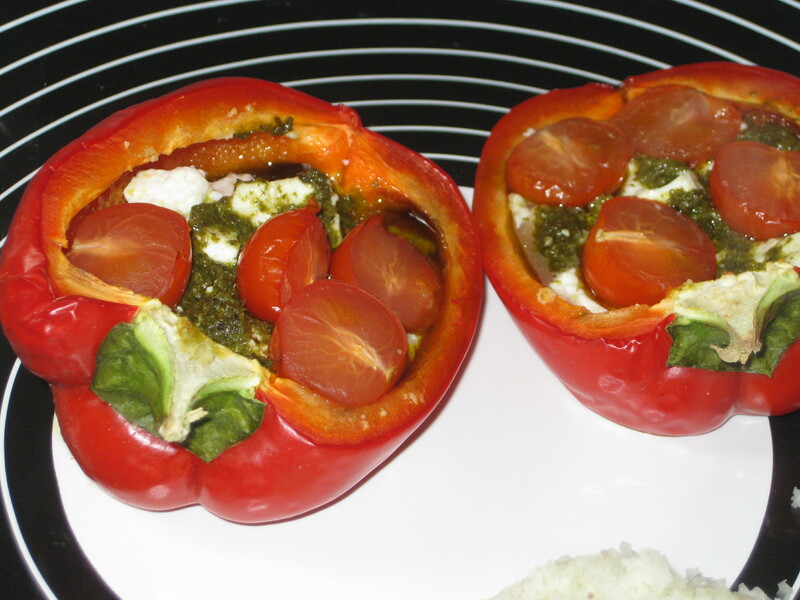 This entry was posted in Vegetarian Recipes and tagged caulfilower mash, Rose Elliott, stuffed peppers, stuffed vegetables, vegetarian dinner. Bookmark the permalink. I’m sorry you’ve been feeling poorly, but what better way to heal oneself than with healthy, fresh veggie dishes like this one? 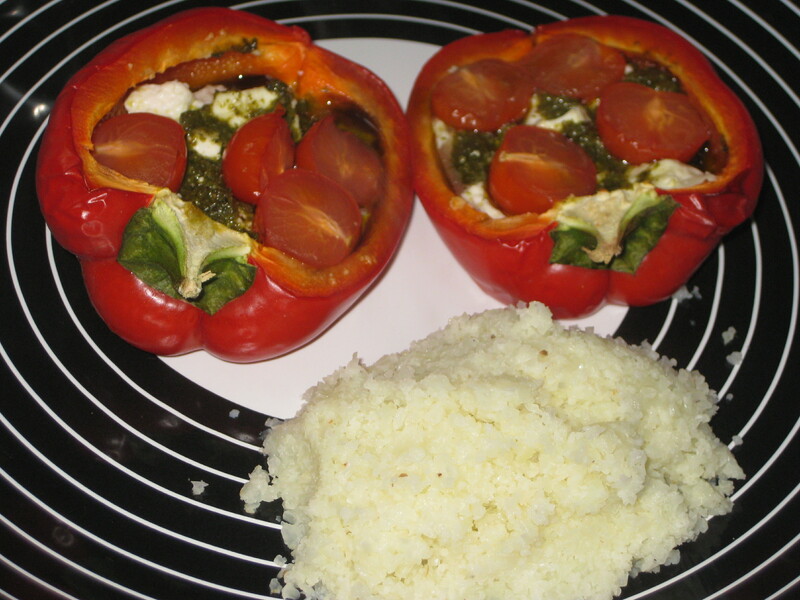 Yes..a cauliflower mash isn’t as rich, creamy and decadent as mashed potatoes, but I love it..and in a pepper with feta? Yes, please! Thanks Lisa, I think the veggies have paid off and I’m finally on the mend!